6 levels of underground carparking, unheard of in Southbank! It seems Coode Island Silt is not a problem here, unusual. Might be getting some more news about this soon. Another planning portfolio meet today. Yesterday crs were briefed on excessive Lloyd Williams tower at 250 Sturt St near Arts Precinct. That's a handsome looking tower - a VAST improvement on many of its neighbours. 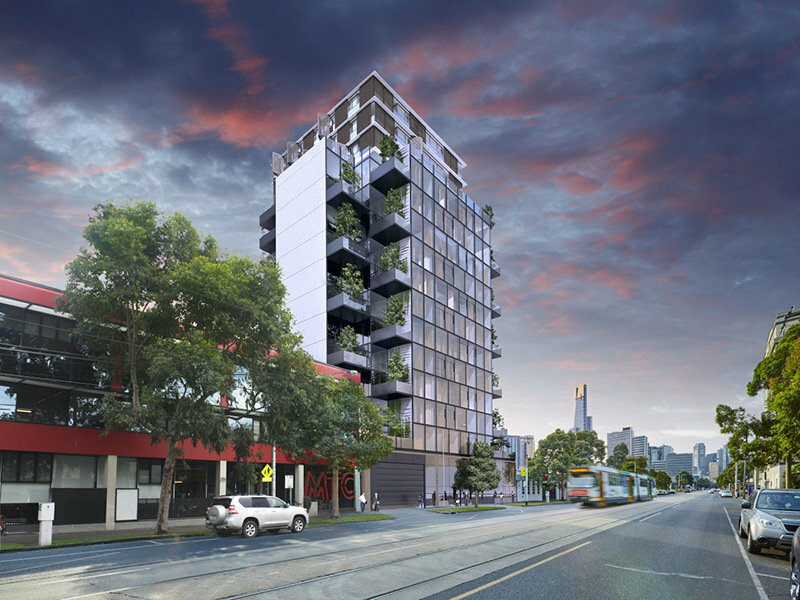 A twisting 123-metre tower planned for Southbank has been rejected by Victoria's Planning Minister Richard Wynne, amid concerns many of the building's 228 apartments would have be left without adequate sunlight. The application for 250 Sturt Street has been accused of blatantly ignoring the precinct's recommended height of 40 metres and attempting to infringe on the development rights of its neighbours. "To put it bluntly, this is a shocker," Melbourne city councillor Ken Ong said last year. This week the $80-million project became only the second central-city application to be rejected by Victoria's new planning minister. He has approved another 15 large buildings worth more than $3 billion. The design of the one and two-bedroom homes in the 40-storey building one of the big concerns of the minister's urban design experts, who recommended the permit be rejected outright. It would be really nice if the planning department actually updated their planning register on a timely manner. Any local council would get told off by the planning department if they kept their planning register in the condition that the planning department does. Also I hope that Wynn will follow the example set by Matthew Guy and actually post planning officer reports on line. No reports have been posted on the website for the last few developments he has decided. I don't think even Matthew Guy would have approved this one. Looked great on the outside but the apartment layouts were crap and the setbacks were all wrong for a site that is not even on a corner. If the tower was setback 2 metres further from the boundaries they might have got away with the height as the reduced depth of the building would have allowed for better apartment layouts. Developers are really doing themselves no favors when they propose stuff like this and then say 'well this other tower was approved with a crap layout five years ago so why can't we do the same?'. They are just making it more likely that government will lose faith in the performance based planning controls and introduce more mandatory height and apartment size controls. I don't know how "Royal Como' got through either. Some of the apartments there are absolutely atrocious, with poor ventilation and lack of natural light. This was even apparent in some of the $1m+ apartments on offer. The agent there even had the gall to say to me that RC is even more up market than the Capitol Bakery development. Hyperbole knows no bounds with some of these land rats. I see why this was knocked back due to the lack of setbacks but what is wrong with the apartment layouts? I don't see any problem with saddle-back bedrooms, it's a bedroom isn't it? Unless you're sitting in it 24/7 you're only using it when it's dark anyways. Or is it more the case that it's valuable floor space being used as nothing but a light corridor? They do look longer than the usual corridors I've seen for that type of bedroom. Having lived in apartments with 'regular' as well as 'saddle-back' bedrooms, I prefer the supposedly poorer 'saddle-back' style. As you say, my bedroom is not used 24/7 and is primarily for sleeping etc... in which case, the slightly lower light level is desirable. The light corridor is also useful storage space. It was also knocked back for poor setbacks, literally right to the boundary. And who are WE or anybody else to say that somebody else shouldn't buy a particular apartment because of it's "layout". If someone wants to buy it....let them. If it were legal under the BCA, plenty of folks would happily buy apartments with 1.85m ceilings, too, Michael. Should they be allowed to? Nope - that's just poor amenity for human beings. But it's not so it's a moot point. "Plenty of Folks"? No sane, well-informed purchaser would ever buy an apartment with such a low ceiling. And it would still be a CHOICE made by the individual...so more power to them. anyone able to find a VCAT ruling for this one? Department of Transport, Planning and Local Infrastructure (DTPLI). ^ What a poor result considering the original proposal. May as well just give it to Central Equity and name it Bland Central. Original proposal was a stumpy mess.